Tickets are now on sale for Jura Tastival 2017 – which returns for a one-day single malt spectacular on Thursday 1st June, offering new ways to enjoy whisky, through a busy programme of one-of-a-kind taste experiences. 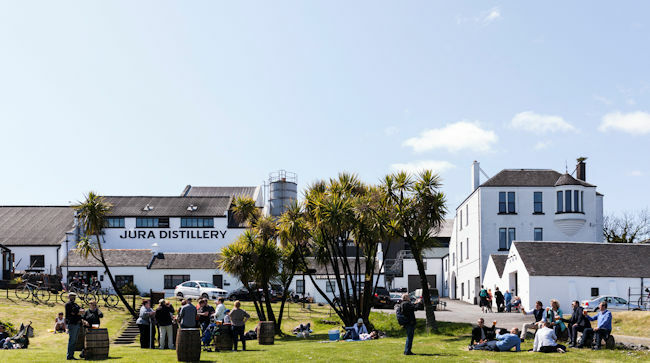 The event will run as part of the annual Feis Ile Festival, which attracts whisky fans from all over the world to distillery open days on Islay and neighbouring island, Jura, each year. Tastival will see Jura’s only whisky distillery throw open its doors to put on a number of free and ticketed activities – from unique whisky tastings and tours, to live entertainment - including music from legendary Scots Trad band RURA - and a chance to join the Jura community at special meet and greets with the distillery team. This year’s Tastival event is limited to one day only (it has spanned two days in previous years) – so whisky lovers are advised get in early to snap up tickets, which are set to be in high demand. The Jura Long Table – Dine with the Diurachs (the name for Jura’s community) at this ‘getting to know you’ session. A special one off lunch in the distillery’s Grainstore, guests will join the locals (including some distillery staff) to hear stories on island life as they enjoy Jura’s laid back take on street food, prepared with the freshest local produce, each dish designed to pair with a dram of Jura whisky. All Terrain Whisky Tasting – Discover the different sides of Jura and learn how the landscape inspires a whisky range as unique as the island itself. Venturing far beyond the realms of the distillery, the Jura bus will stop off at locations from serene beaches, to craggy mountain foots – with a whisky inspired by each location stashed for guests to find (if they listen to the clues) at every stop. Whisky 101 – Meet Whyte & Mackay Whisky Maker & Blender Gregg Glass in this unique session designed for both whisky newcomers and aficionados alike. Smashing perceptions on traditional whisky tastings, guests will be invited to take on a different ‘state of mind’ when it comes to single malt – sampling Jura in a number of non-fluid states, before an anonymous Q&A will give visitors the chance can ask anything they ever wanted to know about whisky…but were too afraid to ask! The Single Malt Masterclass - An exclusive masterclass hosted by Jura Distillery Manager Graham Logan, honorary distillers will get on-the-job whisky making experience – from learning how to keep a careful watch over the spirit gauge, to testing the mash tun and wash backs, rolling a barrel through the warehouse and siphoning whisky straight from the cask. Jura Jetty – Ticketholders will arrive at Tastival in true island style, cruising from Islay’s Port Askaig directly to Jura’s Craighouse, delivered to the heart of the event by Captain Nicol. On their journey, guests will enjoy a special tasting of travel retail exclusive Jura Turas-Mara the way it was meant to be experienced – with the wind and sea spray in your face. Music, live entertainment and the opportunity chance to sample Jura’s range will be available in the Dramming Bar in the distillery’s Cooperage, where guests will have the first opportunity to try, and purchase, Tastival 2017, Jura’s limited edition bottling created to mark the festival. A £5 general entry fee will include a brochure, souvenir glass and two drams at the bar. A cash bar will be available thereafter, with a full drinks menu including drams, cocktails and an exclusive Drygate beer brewed to pair with Jura’s Tastival 2017 bottling. Getting there from Islay: Jura will operate a free passenger ferry and coach shuttle service to and from the Port Feolin ferry station. For more information see www.jurawhisky.com.